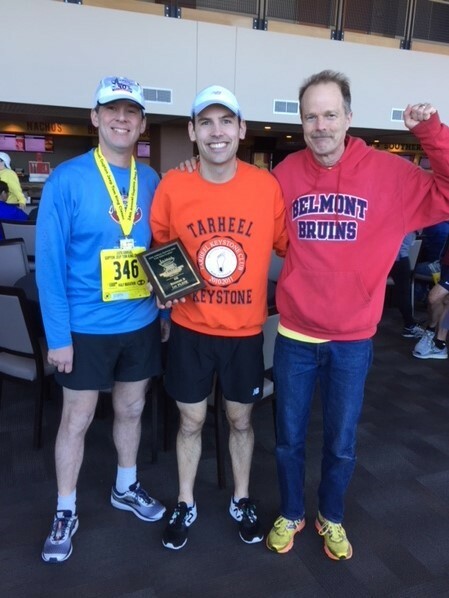 Belmont University’s Corporate Challenge Team placed 1st at the Tom King Classic 5K and Half Marathon on Saturday, March 3. Belmont runners included Chair and Professor of Mathematics Dr. Andy Miller, Associate Professor of Business Law Dr. Haskell Murray, Director of the Honors Program Dr. Jonathan Thorndike and Assistant Professor of Audio Engineering Technology Dr. Eric Tarr. Miller ran the half marathon while the others competed against corporate challenge teams from Nashville in the 5K. The 24th annual race is named for Tom King, one of the founding members of the Nashville Striders Running Club. In 1970, a group of local runners organized and adopted that name for its members, and King was named President. He continued to serve as Club President until passing the baton in 1977. He served on the Board and as an active volunteer as the Striders continued to grow and play a significant role in the running community. The Nashville Striders Board decided to honor King for his role in establishing the Club. The Inaugural Tom King Classic was held in 1995 and staged in Percy Warner Park as a Half -Marathon. In 2001, the event was moved to LP Field and added a 5K. Ken Gupton, owner of Gupton Auto Dodge, Chrysler & Jeep, became the presenting sponsor of the event in 2005.